The role and purpose of the ELC and Primary School Counselor is to provide a comprehensive counseling program for all children in our ELC and Primary School by including teachers, parents and colleagues as well as the leading Restaurative Justice practice as an approach to behavior management. As an ELC/Primary School Counselor your role is to provide a range of services for our school community including individual and small group counseling, providing support and guidance to families, supporting BMS staff, supporting the internal crisis management team and collaborate with the child protection team. Besides you are responsible for working within the transition team to develop and implement a whole school transition education program that reflects the diversity of our school community and supports all community members during times of transition. You are an effective communicator and teamplayer, who enjoys working collaboratively with a team of colleagues to ensure a consistent and cohesive approach to student support is being followed. Your are a committed, experienced and reliable Counselor, who seeks opportunities to extend expertise and looks for improvement to provide a high quality standard. Master’s Degree or higher, in Counselling or Psychology (pedagogical or clinical Psychology). Excellent written and verbal communication skills in English. Ideally good written and verbal communication skills in German. Prior experience working as a Counselor within an international school setting preferable. A modern, inspiring work environment with international employees and an open school community. 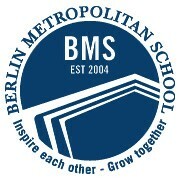 Our school campus is located in the heart of Berlin with excellent public transport connections. The opportunity to grow in an interesting environment and to define new quality standards in the field of education together with us. Our co-operation and the sense of belonging together are characterized by a special team spirit as well as respectful and harmonious interaction. Our open-door-culture in the leadershiplevel, joint learning and collegial case consultation make up our supportive cooperation. We offer continuous personal development through "Professional Development Days" and individual training. Other benefits including daily free lunch for our staff and sabbatical opportunities.